Horses that are ridden hard may sometimes develop a sore back. This is not necessarily the horse’s fault but may have something to do with the way the horse is ridden or the tack used. 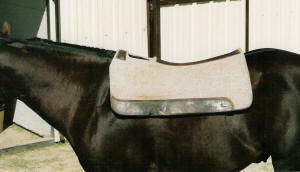 Cut-away saddle pads are made with an opening to fit over sore spots on the horse’s withers. However, there is another use for this type of pad. The area over the rear vertebrae between the kidneys sometimes becomes tender. 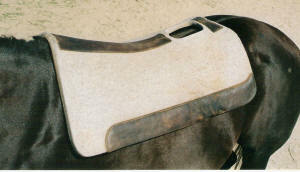 Turn the cut-away saddle pad around with the cutout portion to the rear of the horse. By doing this, you prevent the saddle skirting and its lacing from rubbing on the your horse’s rear vertebrae. Then you can ride your horse while allowing the horse to heal. I know this works because we have had horses that were sore-backed and we healed them up and were still able to use them. The Wells 5-Star Contoured Saddle Pad – 100% virgin wool 30X30 – 7/8”- thick, cutaway over the withers, is a great pad to use. This pad also remains flexible in cold weather, which is very important.